Stage manager Jeff Van Duyn came out to tell host Adrian Belew that the event was not, in fact, the Rock and Roll Hall of Fame induction ceremony. 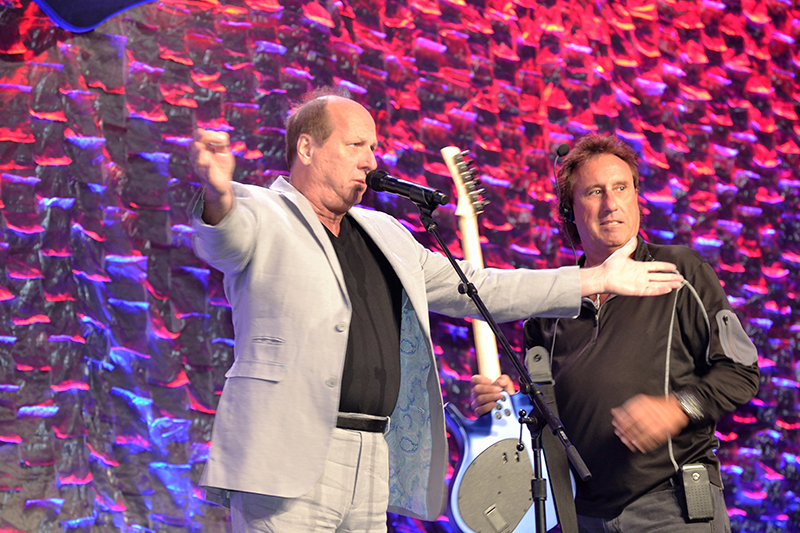 Adrian Belew, Tom Petty, Richard Fernandez, Danny O’Bryen and Greg Mackie were among the impressive list of luminaries at the 2016 Parnelli Awards. This year’s honorees, award winners, and guests celebrated at the largest Parnelli Awards ever produced during the annual bash held on Oct. 22, 2016 at the Rio Hotel and Casino in Las Vegas. The much anticipated evening is not only about honoring our peers but it really is a testament to the collaborative and supportive nature of our industry as the Parnelli’s list of production partners makes clear. Access Event Solutions, Atomic, OSA, PRG, SGA Production Services, Stage Crew, and TPI Technical Productions Inc. all contributed to the successful production. The event’s load-in, with lighting trusses, scenery and projection screens in place. The Who’s Who of companies and production talent that lend a hand are also greatly appreciated by Kevin Mitchell, producer/writer of the Parnelli Awards. “It has been really exciting over the last couple of years as we have been able to up the quality of the production thanks to our partners really coming forward in a big way,” states Mitchell. “The show just keeps getting bigger and better every year and, of course, that means it gets more complicated,” Mitchell adds. “It’s thanks to our production partners that we’ve gotten so much bigger and become a really professional event. Ten years ago, I would’ve never dreamed I’d be sitting where I am in terms of the quality of the vendors who partner with us, who donate the gear, their teams, their time and their services to us. They don’t have to do this yet they do it and the best part is they really want to do it; they want to be part of honoring the work done in the industry. Producer Kevin Mitchell adjusting the script. PRG provided some lighting for the show.